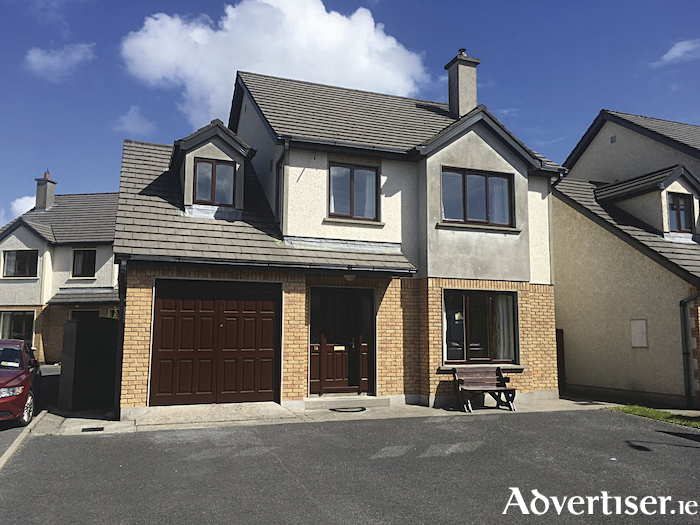 Colleran auctioneers has just placed on the market for sale a bright, spacious, five bedroom house which is very different to anything out there due to the quality of the finish and fittings. No 14 Cluain Airne on the Clybaun Road is tucked away in an exclusive cul de sac with every amenity on its doorstep. What sets this five bedroom apart is not only the guide price of €380,000 but the many quality extras that must be viewed to be appreciated. Considerable money has been invested in this home and it shows in the quality, space, and light on offer. The entrance hall and sitting room have beautiful solid oak timber floors, which continue into the dining room, and the very spacious sitting room has been fitted with an oil fired stove. It is the kitchen that sets this home apart. There is a very generous range of built-in and overhead cupboard space with granite worktops. The floor is beautifully tiled, and there are attractive light fittings. Views of the back garden are through patio doors in the dining area, which opens out onto a large deck, perfect for summer barbecues. There is also a separate back door from the utility. On the first floor there are five bedrooms with master bedroom en suite and a tiled bathroom. A surprise benefit with this house is the converted attic. There is also a garage for additional storage. Located within walking distance of two shopping centres, hotel, leisure centre, schools and parks, most amenities are on the doorstep, as is a regular bus service. This is certainly a property anyone would be proud to call home, and at a guide of only €380,000 to include all the extras, it could be yours.